1) Is there a way to get the DNA to not stop when scrolling through home screens like before? It stops and you have to swipe back the other way? 2) When I had my phone charging beofre I could swipe down and see a confirm that it was charging. Now I have to go into settings and click battery to see if it's charging? Is there an easier way? 1) None that I'm aware of. Try a 3rd part launcher if you can't live without it. 2.) The battery icon at the top changes when you're charging (tiny lightening bolt overlay on the icon). You could also install an app that gives a notification (like GSam or the like). Kind of strange that they would make an important feature obsolete. I'm sure if this appropriate, but I have some questions of my own following what ever update my DNA got yesterday. How do I tell which update it ran, and where do I look to see what version I am currently running? What version should I be running? Why did my 'iheartradio' icon disappear? Sure it's appropriate! Do you remember the size of the update you installed? how many MB? Even if you don't, go to Settings/About/Software Information. 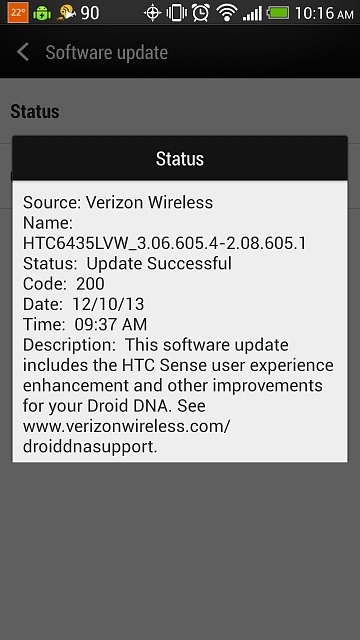 After the update, you should be on Android version 4.2.2, HTC Sense version 5.0, Software number 3.06.605.4. Take a look and see what your phone says. I got a smaller update first which prepared my phone for the the much larger update that followed. The larger update is what bumped me up to 4.2.2 and Sense 5 with blinkfeed. Let me know if you have any questions. I don't remember, but I think the Iheartradio app was an app that came pre-installed on the DNA, and I'm guessing it's no longer part of the software package on this version. 10 attempts or device data will be deleted. Is this normal for the lock screen? From what I understand, it is normal. I don't lock my phone (I know, I'm such a rebel), so I haven't even seen it, but plenty of other people seem to think it's a good thing since it protects your data from prying eyes and thieves. Has anyone noticed screen shots no longer go into all photos unless you have that folder showing in the gallery? Not happy about that! I'm pretty worried about this feature. I cannot figure out how to disable it. In approximately 1 minute, just to be a jerk, anyone can wipe my phone clean with hardly any effort. Has anyone figured a way to remove this feature while still being able to lock the screen. My text messaging actions are INCREDIBLY slow now. Anyone else have this problem? Is there a "home" feature on the stock browser or chrome? New to chrome but on the stock one it used to be on the pull down menu in the upper right with the 3 verticle dots. I found in the settings how to change your home page so it must be somewhere. the update that came through only took about 30 minutes so it couldn't have been too big, my software update checker says I am up to date, so I guess I'm in good shape. Sadly, to me most of the information on that page is jiberish. I have a ten second delay when trying to send a message. So frustrating!! I just use Google hangouts for SMS. Works perfectly for me, and I love the clean interface. I take it this specific to Sense 5, not just a general Android 4.2 thing? I can't begin to fathom why anyone thought this would be a good idea; most people who own smartphones aren't tech-savvy, and I can easily see someone's data being completely wiped because some kid, vengeful friend, nosy sibling, or **** pocket got in the way. At the very least, we should be able to disable that feature. If a complete data wipe erases everything--including security/tracking apps, how is that the optimum solution? I've spoken with Verizon reps who are clueless, and chatted with an HTC rep who could only say that it was implemented "to enhance security" and can't be disabled. Texting is horrible after the update!! Forget trying to send a picture or be part of a group text. I takes a full minute to open and respond to a group text. Will installing firmware update after rooting brick my S4? By jerkyg in forum New to the Forums? Introduce Yourself Here!